My current entrepreneurial and blogging efforts will be drawing to a close over the next two weeks since I have accepted an offer from Microsoft to be a Software Design Engineer in Test (SDE/T), developing tests and software tools for testing in the Cellular Core team of the Mobile and Embedded Devices Product Group (MEDPG) in Redmond. That includes the low-level software that goes into smartphones and other gadgets based on Windows CE. I may eventually resume some amount of blogging in some form, but probably not for some time since I expect it will take 250% of my effort just to come up to speed and get at least slightly ahead of the curve over the next six months. Oh, and since I'll be joining "The Evil Empire", please... pray for my soul! The world may no longer be safe with me on Microsoft's side. I'm just clearing off my desk as I prepare to finish up with my last day at my current client, so I am now available for new assignments. My resume can be found at: http://basetechnology.com/resume.htm. I can email it in Word document format upon request. I've just posted an updated version of my proposal for a Distributed Virtual Personal Computer (DVPC). Let me know what you think or if you know of competing proposals or products. Thanks. I still have no intention of personally designing or implementing the details of such a product or even developing a business around the concepts, but I would like somebody to do it so that one of these days I can buy a new PC and it will come with DVPC right out of the box. 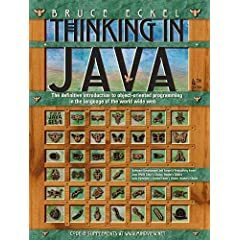 If you're serious about sinking your teeth into the Java programming language, check out "Thinking in Java (4th Edition)" by Bruce Eckel. BTW, I get a commission from Amazon if you buy the book after clicking through my link here.